Richard Giles, writer, astrologer, geomancer and Feng Shui consultant, was born in Adelaide, South Australia, spending his childhood in sunny bliss in the climate of the City of Culture. The Vietnam war and conscription turned him towards another way of life. Spiritual journeys in Thailand, India and Indonesia with Buddhism and meditation led him to a new analysis of the world. He took up astrology in 1987 and more recently Feng Shui. Richard lives in sunny Queensland in the valleys of the hinterland of the Sunshine Coast at Crystal Waters community, where he works as an astrologer and Feng Shui practitioner and writing for various magazines and newspapers. He organises the 2 day Crystal Waters Astrology Conference each year in October. Richard Giles takes a brief look at Feng Shui, a time-honoured method of harmonising the features of the landscape and the environment. The ancient Chinese art of Feng Shui is not just some dusty remnant of the past, but is widely employed today in Chinese communities throughout the world. It is also becoming increasingly popular in the West, as we become more aware of how subtle energies can affect our lives, our state of mind — and our prosperity. The phrase Feng Shui translates literally as "wind" and "water". These two elements summarise the common components that make up any landscape. Feng Shui is a Chinese-derived system for measuring the influences of land features, water courses and the built environment. Its value is in offering guidelines for learning to live in harmony with the surrounding environment and for appreciating and harmonising yourself and family to your own household and property. Approximately eleven hundred years ago (9th century AD) two great Chinese scholars wrote down the first systematised approach to working with the scenic and landscape features of the environment. This became the standard text on Form School, literally the Land Forms School. A hundred years later the principles of the Compass School were laid down, i.e., using compass direction to work with structures and land. A simple way to begin working with your own living situation is to look at your home or business and learn about how the different sectors of the house relate to parts of your life. Feng Shui teaches that the house reflects the owners and the owners reflect in the house. Success, failure, illness, career direction and much more in life can be read from the layout of the place where you live. Amazing? Feng Shui is often referred to as geomancy, but in fact the Chinese approach embraces more than just western geomancy, which is the business of dowsing land forms and energies. Feng Shui contains this and more. It isn't just mirrors and wind chimes, which can be used to help balance inauspicious energies. It's a total system of numbers and form, integrating the person with the home and landscape. A skilled practitioner can come into your home or business and advise you on layout, colours and form of the building, to help you increase family harmony, improve your health and expand wealth. 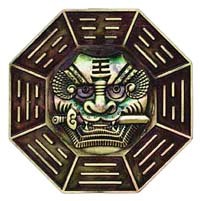 A respectable Feng Shui expert will use a compass, do the numbers on your house and compare them to your birth date numbers before making recommendations. Why not try it sometime soon?